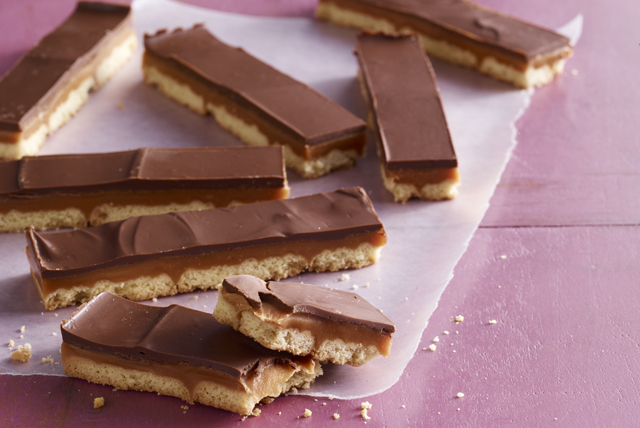 Layer shortbread cookies with deliciousness to create these Chocolate-Caramel Cookie Bars! Our Chocolate-Caramel Cookie Bars are like a favorite candy bar. Line 13x9-inch pan with Reynolds Wrap® Aluminum Foil, with ends of foil extending over sides; spray with cooking spray. Arrange cookies in single layer on bottom of prepared pan. Substitute 1 pkg. (11 oz.) KRAFT Caramels for the caramel bits. The combination of semi-sweet and white chocolates results in a chocolate mixture with the flavor and texture of milk chocolate. In a hurry? Refrigerate dessert 15 min. before cutting into bars. Serve at room temperature.